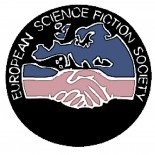 The European Science Fiction Society is proud to announce the Winners of the 2014 ESFS Awards. These awards were announced on the 24th of August 2014 at the 36th Eurocon, Shamrokon, in Dublin. These Awards are granted according to the suggestions from the National Delegates to a young writer or artist from each European Country. This entry was posted on 24/08/2014 by omegar in Uncategorized and tagged Awards.